We’re more than halfway through January and there’s a few interesting things going on.  Last month I took the view that we should be more than a bit skeptical of polls on during some of the busiest shopping and office party times of the year that show large moves. This view wasn’t popular among those trying to push a narrative relating to actual events (such as the pre-budget statement) but the distortions have indeed unwound, with Opinium and ICM showing smaller Labour leads and Ipsos-MORI showing a very tight contest rather than the Conservatives three points clear. 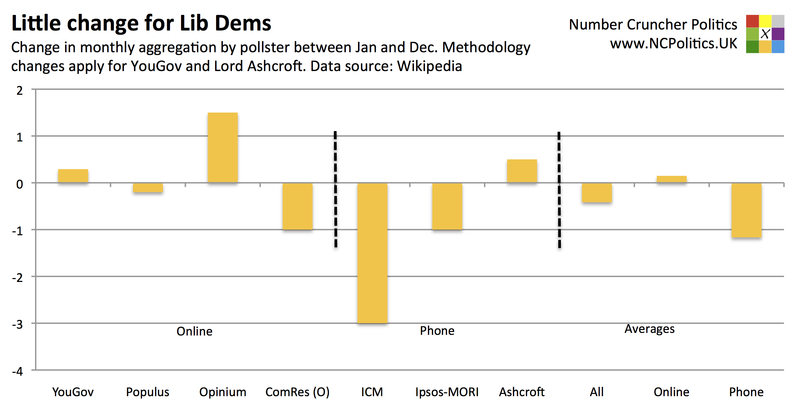 The main move is with ICM, who showed a rather high Lib Dem score of 14% last month. This month’s drop partly reflects a reversal of that, but also the effect of 2010 Lib Dem voters moving from “Don’t Know” to the Greens – this reduces the reallocation under ICM’s spiral-of-silence adjustment, hurting the Lib Dems. Perhaps the starkest contrast is where the Greens and UKIP are involved. 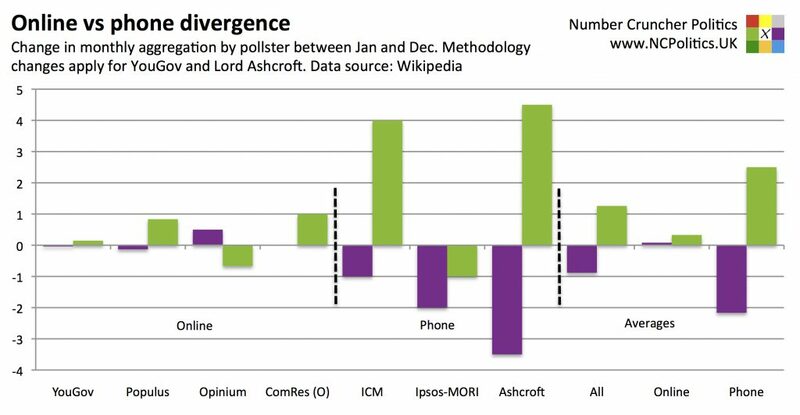 YouGov show very little change for either party on the month, and no online pollster (on average) shows more than a one-point move in either direction. 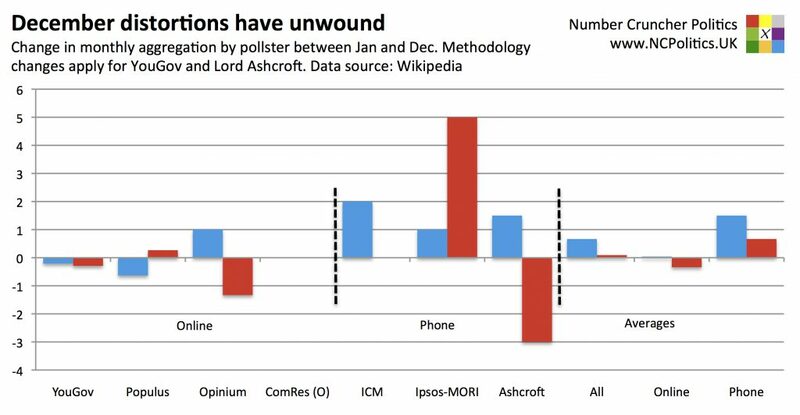 But among phone pollsters, the difference is stark – UKIP are down in all three, while the Greens recorded their highest ever scores with ICM (9%) and Lord Ashcroft (11%). Ipsos-MORI showed the Greens dropping a point, but from MORI’s highest ever Green VI (9%) last month. Quite why this is happening isn’t entirely clear, but it does seem to be a trend, so it bears watching.